3M manufacture various steel and carbon fibre cylinders for use with breathing apprataus. 1045898 CYL-600 3.0 litre, 200 bar, steel cylinder, CE specification, painted to BS specification, complete with cylinder valve fitted with safety locking handwheel. 600 litre free air capacity providing total duration of 15 minutes*. 1045920 CYL-820 3.0 litre, 300 bar, steel cylinder, CE specification, painted to BS specification, complete with cylinder valve fitted with safety locking handwheel. 820 litre free air capacity providing total duration of 20 minutes*. 1045790 CYL-1200 6.0 litre, 200 bar, steel cylinder, CE specification, painted to BS specification, complete with cylinder valve fitted with safety locking handwheel. 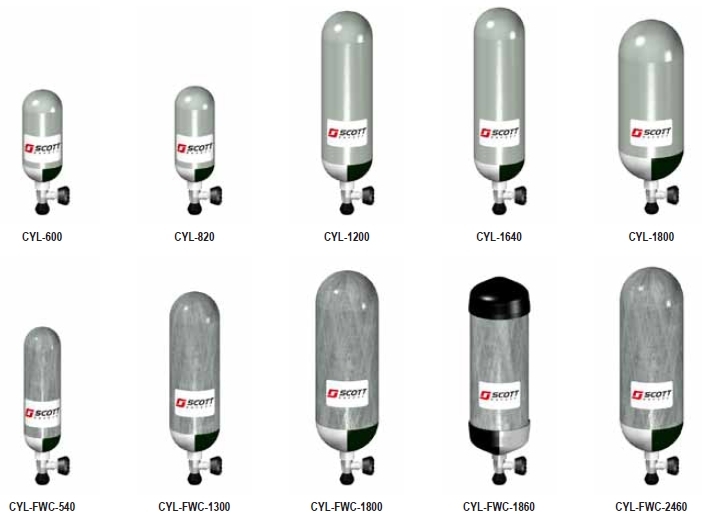 1200 litre free air capacity providing total duration of 30 minutes*. 1045831 CYL-1640 6.0 litre, 300 bar, steel cylinder, CE specification, painted to BS specification, complete with cylinder valve fitted with safety locking handwheel. 1640 litre free air capacity providing total duration of 41 minutes*. 1045856 CYL-1800 9.0 litre, 200 bar, steel cylinder, CE specification, painted to BS specification, complete with cylinder valve fitted with safety locking handwheel. 1800 litre free air capacity providing total duration of 45 minutes*. Please specify whether cylinders are to be supplied FULL or EMPTY - NOTE - Article numbers refer to full cylinders Charged cylinders are classed as hazardous and may not be sent by certain types of carriage. Please check with customer services for carriage details.